While we all wait for the next big battery life breakthrough, a lot of us find ourselves in need of a recharge while on the go. And if you're like me, you aren't a fan of searching for an outlet when you're out and about. But when there's a charger in your car and a high-capacity portable battery charger in your backpack or purse, your problems are pretty much solved. If that sounds appealing to you, we have a deal: 15 of you will get both of those from our friends at CHUWI. CHUWI has a lot of stuff you'd like, but let's take a closer look at what you're getting in this giveaway. 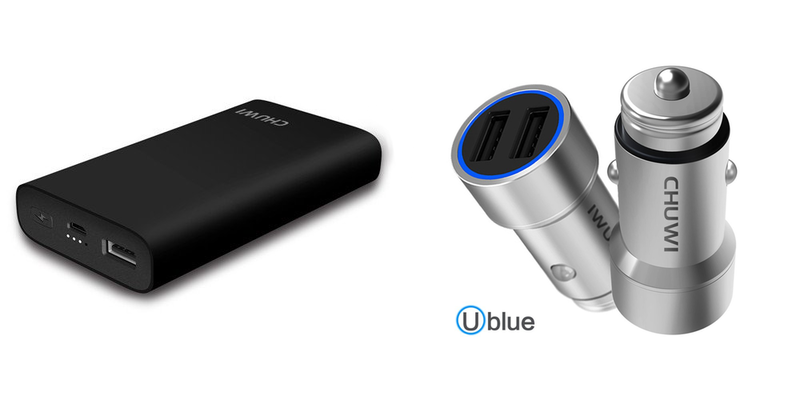 The CHUWI Ublue car charger features two 2.4A output USB ports in a handsome, brass package. It features a signature blue light specifically designed not to distract or strain you when driving at nighttime. Learn even more at Amazon. The other thing you will win is CHUWI's 10,050 mAh portable battery. This battery will give most flagship phones up to 3 charges, so you won't need to recharge the battery after every use. But when you do, it won't take long; it supports Qualcomm Quick Charge 3.0 input. Just as important, it will charge your devices via QC3.0 as well, making it both portable and fast. It would run you $25 at Amazon, where you can check out some of its other specs. If you didn't win, CHUWI has decided that you still deserve something. They are offering discount codes for both products. For the portable battery, using the code 4ICEUUKA at Amazon will reduce the price to $16.99, an $8 savings. For the car charger, the code FCCNAFKJ drops the price to $6.99, a $9 discount. To enter the giveaway, see below. You must have a US mailing address to receive your prize. Winners will be chosen after entries close at 11:59pm Pacific Time on Monday, May 8th. Be sure to stop back in every day to get your daily entries!